Red Creek jasper occurs in rare pockets in the mineral rich Land Down Under. It features wildly colorful scenic landscape patterning in hues ranging from soft grays to blues, beige-y mustards to yellows, dusty pinks to almost true reds with a few shades of green as well. The most uncommon finds have them all! 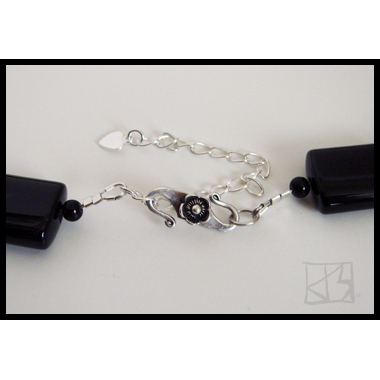 This rectangular cabochon evokes many images and emotions... everyone who's seen it sees something different. I see a Fauvist landscape of leafless trees in a field of red with a watery horizon beyond... If this was an oil painting, van Gogh would approve! 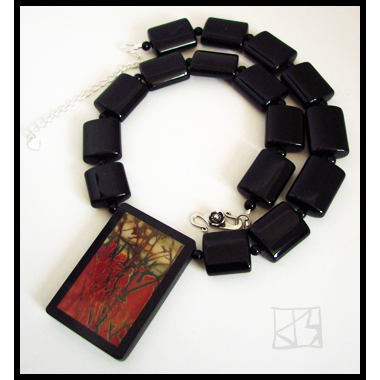 This masterpiece of nature is framed in black onyx -- a technique called intarsia -- and hangs from carefully selected curved blocks of onyx that quietly serve the centerpiece by leading the eye to the riot of color within. 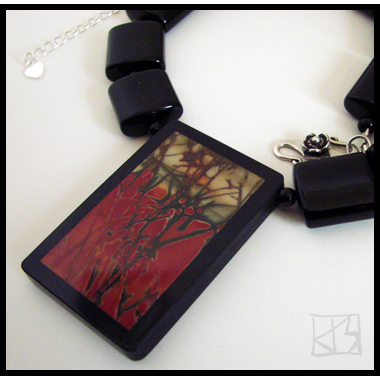 I see this as artsy and elegant, contained yet wild... if a picture paints a thousand words, what will wearing this piece express about YOU?